How many times have you been frustrated trying to get hold of a plumber or carpenter to fix a leak or maintenance of the wooden furnitures? Were there times when you felt that the household service was overpriced?Didn’t you always need a person who would understand all your feelings and needs and get your work completed even before you get home from office? Bangalore based Bro4Uis all open for all your questions. 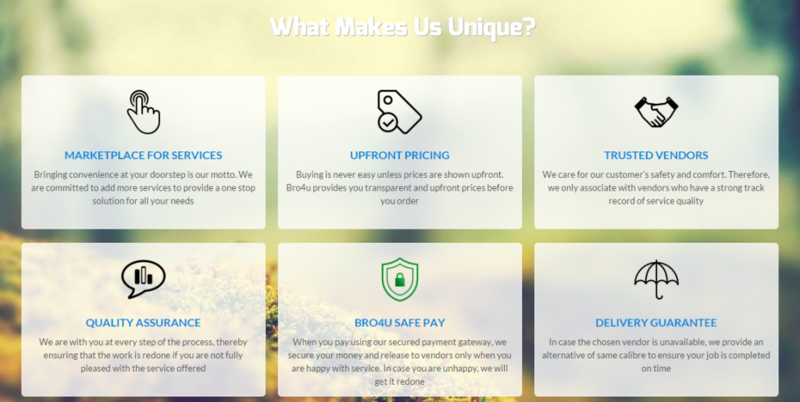 Bro4u.com is the fastest growing marketplace for services built to simplify people’s life by providing a broad list of personalized services at their fingertips and then at their doorstep. Bro4u.com is the first ever one-stop e-commerce marketplace for services. All you need to do is choose, compare, book and leave the rest to us! “Our vision is to become the single largest technology platform globally for wide variety of services with a clear motto of creating value for customers, service providers, and our ecosystem”, says Pramod, Founder and CEO, Bro4u.com. [su_box title=”More startup of the week choosen by DSIM:-” box_color=”#c7c7c7″ title_color=”#000000″ radius=”5″]1) How Parcelled increased its order size from 2 digit to 2500+ orders a day? Why we choose Bro4u.com as Startup of the Week? • Thecompany creates larger visibility to service providers in our website by having detailed store like a profile to each service provider’s and thus helping them to reach wider audience. • Bro4u is trending second in rank in terms of internet traffic engagement when compared to other home marketplace start-ups as per Alexa rankings. • They offer a wider range of around 20 services to the customers including Purohit Booking, Plumbers, Carpenters, Electricians, Water Tank Cleaning, Painters, Cakes and flower delivery, Pan Card and Passport consultants etc. • The company has increased its reachability to over 8500 people on Facebook and 224 followers on Twitter in this short span of time. • The app has been downloaded and used by more than 13K users. • The company shows real time data of available nearby vendors, prices, profiles, ratings etc. Started in February 2015 in Bengaluru with only handful of household and professional services, they have extensive plans to expand their services to other cities across India and even globally. Pramod resigned from his impressive MNC job and started pitching his startup idea to his friends and colleagues. Pramod pitched the business idea to the team members in the park, over the phone, on the road and many other places and good thing was the next day that members were joining the team. Even though bootstrapped with very little capital, Bro4U has extensive facility to cater home service needs of whole Bengaluru. However, they are currently looking for bigger seed round to expand in Mumbai, Delhi and Hyderabad. Currently, they have 700+ vendors on their platform and their digital vendor acquisition rate is growing by 10% every month. Since their inception, they have served 2300+ orders successfully and they are getting 30-35 orders and 35-40 enquiries daily on average. When looking to the revenue model of the company, the company gets commission from vendors on every successful order. The company islooking over $ 50 Billion market and is trying to solve local service and other professional service challenges. To market the startup, the company has used all the free marketing platforms like YouTube, Facebook, and blogging to their fullest potential. Since they are planning to expand and enter Mumbai, Hyderabad and Delhi in the next 4-6 months, they are seeking 300-400 new employees support by the end of the year 2015.